Minecraft PE Builds: Angry Birds Silver Bird and Mighty Eagle! Hello, guys! This is Arca. 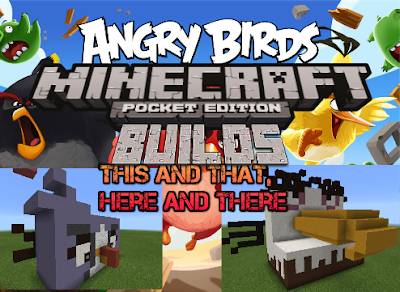 The only two Minecraft PE Angry Birds Builds I had left were the Silver Bird and the Mighty Eagle. So without further ado, here they are! The Silver Bird (named Silver), is a bird that not as many people know about. She is from the game Angry Birds 2, released last year. The one I built is mostly grey, with some white shaped like a triangle in the centre. There are two grey curves next to her eyes. She has round eyebrows above her eyes. To make the eyeshine in her eyes, I put a stone button on each. She has two black tail feathers and two curved grey head feathers. The top of her beak is red and curves over the bottom part, which is yellow. The mighty eagle is my 3rd biggest Angry Birds build I made so far. The slingshot is the biggest, and the Red Bird was too much oversized. He has brown stomach feathers with parts sticking out in many different sizes. His stomach is in front of the rest of his body. He has a big yellow curved beak. He has purple eyelids, and very bushy eyebrows. He has three black head feathers, but it isn't that visible from the screenshot I took because the eyebrows are blocking it. He also has three black tail feathers sticking out, and some of them are slightly curved. That is the end of my Angry Birds Minecraft build series! I will do more Minecraft build series's in the future, and maybe even one for Angry Birds Star Wars! Thank you for voting on all the polls I have made for this on Google+. Stay tuned for more awesome posts every day! Thanks for reading this! See you next time! BBBYYYYYEEEE!! !